How many girl mamas in the house?!? Please tell me that I'm not the only one who has a little girl that is princess obsessed!! 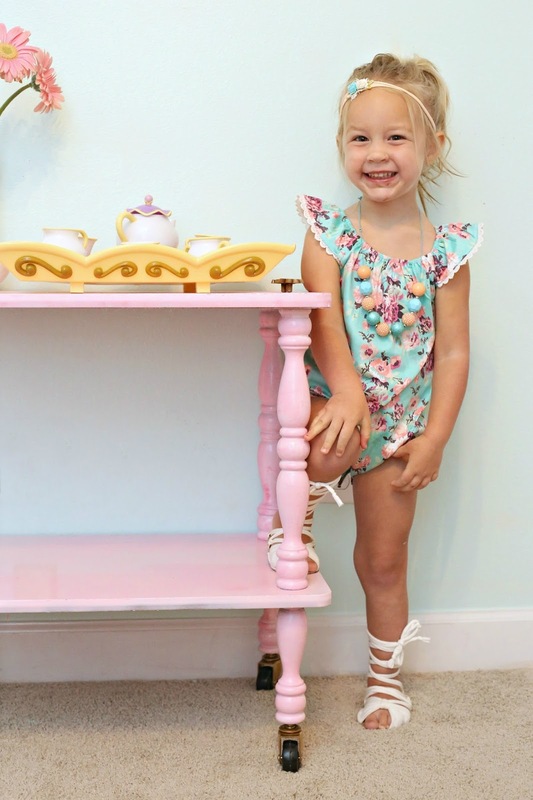 We are all about all things girly, twirly & pink over here. She tells everyone that it's almost her 'birt-day' and it'll be 'Belle'. And, yes, expect that post late August because we will be partying it up with Mrs. Potts & the crew for her big 3!! This little project came about because of two happy accidents. Number 1 being that we've had a couple hundred tea parties & it seemed necessary that we picked them up a notch- because, why not?! And 2 being that I had this little guy hanging around the garage while I waited to see what I was going to do with it. This one was a freebie given to me by a coworker who didn't want it anymore. I almost didn't take it because I didn't have an instant inspiration moment but luckily I snagged it anyways. It needed a little love before painting. I sanded it done to smooth out stains, marks & some rough areas. Some of the faux wood trim around the edges was peeling away so I wood-glued those suckers back on and allowed it to dry under painters tape for a bit before taking that off. I tightened all the legs & then went for it. A princess cart calls for princess pink, right?! 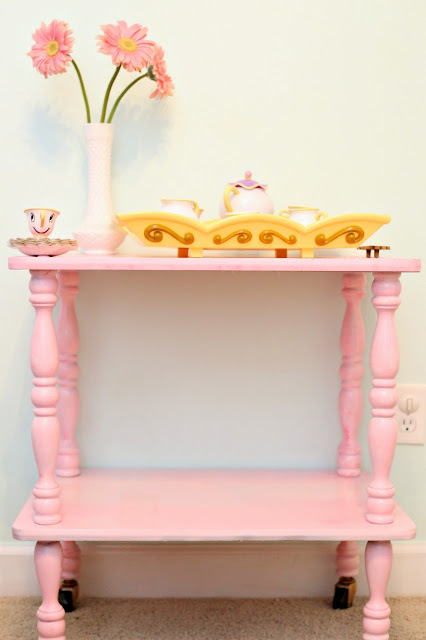 I used 'ballet pink' rustoleum spraypaint I believe. It was a can I had lying around so when I asked hubby to snag another can on his way home because I had a few places to touch up, he couldn't find anything matching it. Negative points for Lowes right there. 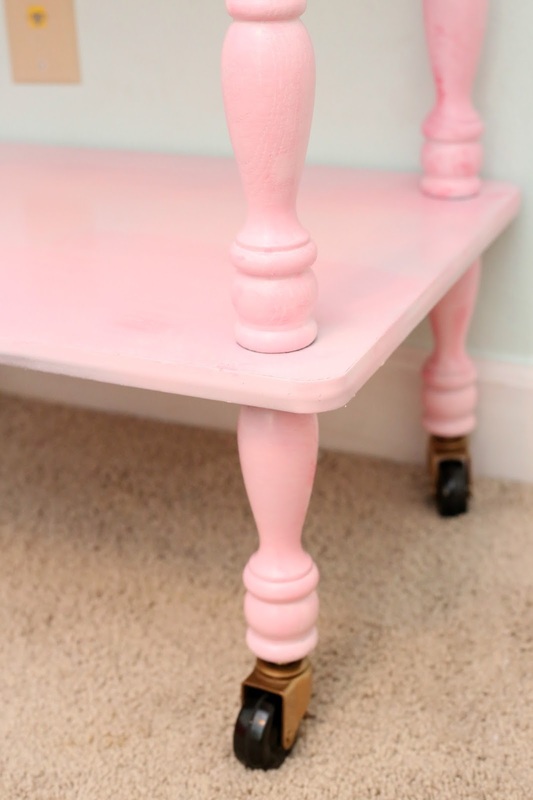 I ended up finding some dark pink sample paint, lighted it up with some white paint and was able to make it all work. Score one for keeping all the extra paint forevverrr. Funny story, Hubby also grabbed some mini casters while at Lowes when he had the fail with the spraypaint. And the casters didn't work either. I rummaged around the garage in my spare parts drawer and somehow managed to find FOUR identical spare casters I had lying around. The exact size and style I needed. I mean, if that's not fate- what is?? I taped off the wheels and spraypainted the casing gold. I got incredibly lucky in that this little table had had casters on it at some points in it's life so it already had holes drilled into the bottom of the feet. I hammered my casters in and they were the perfect fit. And I had to tell hubby that everything he bought me on the way home from work didn't work but SURPRISE I found everything in the garage. Sorry, hun, for spending money when we already had it. Fate struck a third time in finding these gorgeous, scrolly pulls in the spare parts drawer too. I keep all old hardware I pull off of pieces. And sometimes, I'll stop to get hardware off completely destroyed pieces I've seen on the roadside just because... you can't find them like that anymore. I spraypainted them gold, predrilled the holes into the top & attached the pulls. 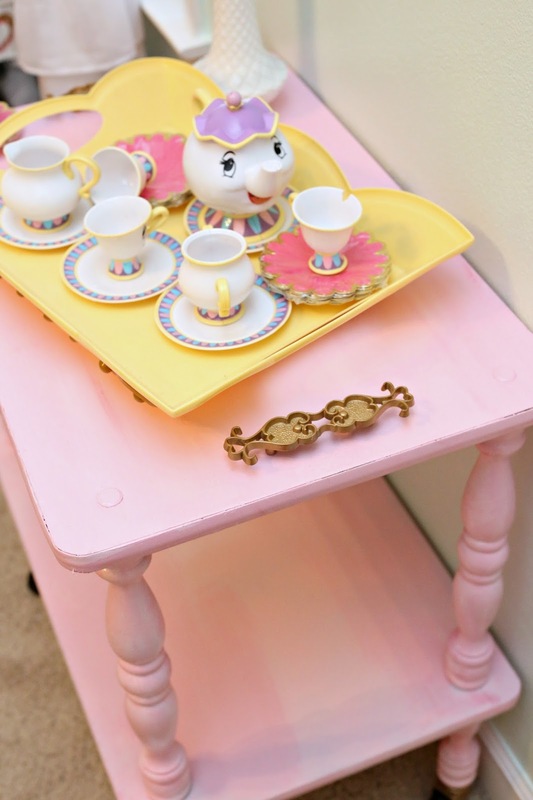 Isn't it the perfect fit for her Belle tea party set? How about a little before & after? 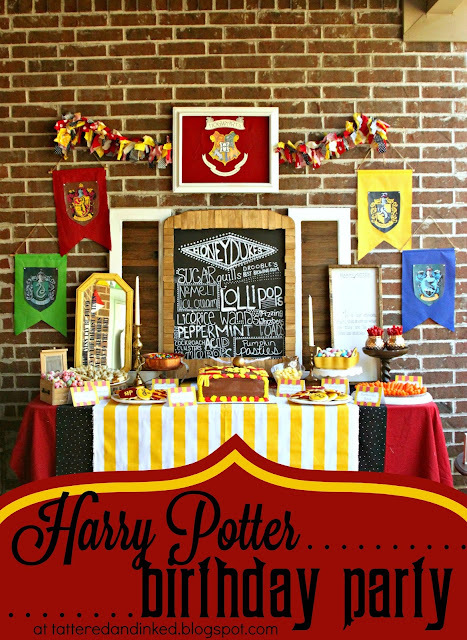 I can't wait to use it at her party too for a perfect little tea prop! She was so excited when I rolled it in, I thought maybe I should have saved it as a gift for her party. But we are having way too much fun with our pretend tea parties now, that I'm glad I gave it to her early! 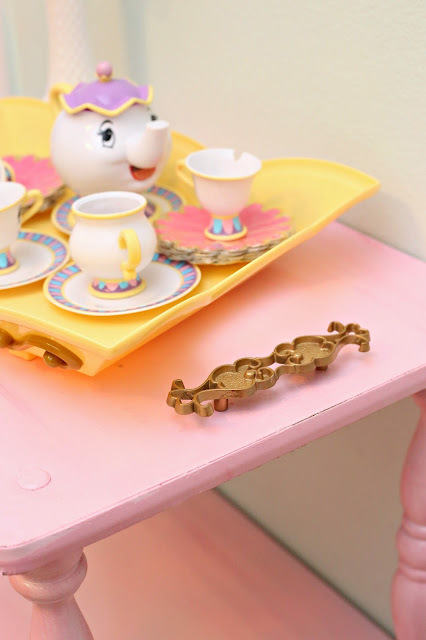 She rolls it from room to room & offers tea & whatever random items she finds for 'nacks' to give out. What do you think of our little table makeover? The fun thing is, Goodwill & flea markets usually have similar tables for pretty cheap that I've seen. So be on the look out!! Like me on Facebook. Follow me on Pinterest. Subscribe to my feed. Hey guys! My name is Kelsey and I'm a DIY-er momma and occupational therapist. 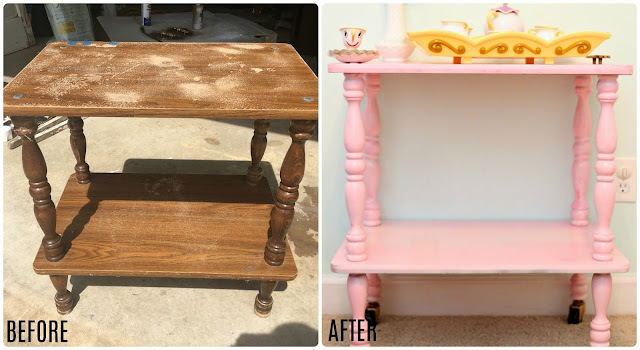 I have a passion for DIY Decor and LOVE a good furniture redo. I'm one of those crazies pulling sad things from the side of the road to make beautiful again!! I suffer majorly from the "I-can-do-that" syndrome and am constantly redesigning and rearranging our space. This blog serves as an outlet for all my creative moments and will hopefully serve as some inspiration to all my lovely followers! All original pictures, tutorials and ideas shown on Tattered and Inked are owned by me. If you decide to feature or use any images from me, I ask that you please link back to me. Tutorials are for personal use only. Free printables from Tattered and Inked are for my followers only, so please subscribe to my blog by any of the options above. If you have any questions, please email me at tatteredandinked(at)yahoo(dot)com. I'm so glad to have you and hope you enjoy looking around! Thanks! !